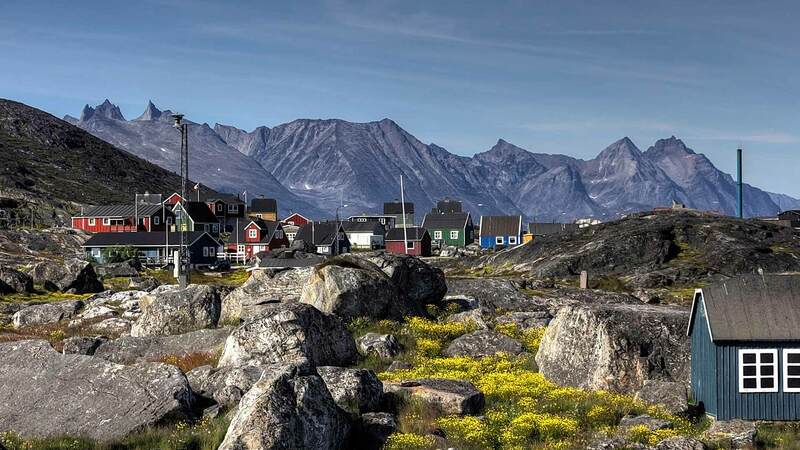 This unforgettable journey showcases the striking contrasts of Greenland, from the fertile green landscapes and Norse Viking history in the south to the ice-filled fjords and rich Greenlandic culture on the west coast. With overnight stays in three towns— Narsarsuaq, Nuuk, and Ilulissat—you will get a taste of the local way of life along with free time to enjoy optional activities such as hiking, kayaking, helicopter tours and iceberg cruises. Board a morning flight with Air Iceland Connect from Reykjavik Domestic Airport to Narsarsuaq. Enjoy the route to the town, before you transfer to the hotel by car for check-in and an information and welcome meeting followed by short city tour of Narsarsuaq. Settle in at the hotel in the evening and enjoy an included dinner. Spend the night in Narsarsuaq. Note: We strongly recommend booking optional activities well in advance with your travel consultant at Nordic Visitor. Please note that some activities are subject to a minimum number of participants along with having specific travel departure dates. Contact your travel consultant for more information. 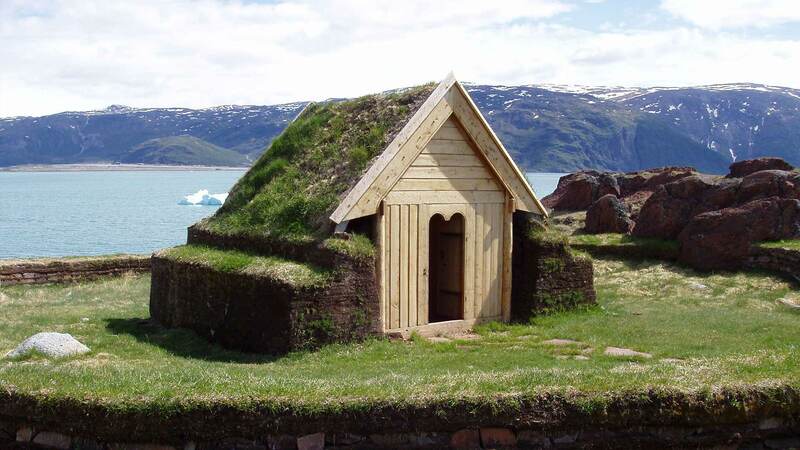 Today, enjoy exploring Narsarsuaq today, a town located within the eastern settlement of the Greenlandic Norse. Nearby is the Brattahlíð farm of Erik the Red, which was established in 875. Narsarsuaq and its immediate surroundings in Tunulliarfik fjord hold incredible significance to Greenland’s history, for the land where Narsarsuaq now stands earned Greenland its name. The Norse Vikings settled in this vicinity many centuries ago and gave Narsarsuaq a name that hints that an Arctic forest covered the large plain. Today, we highly recommend you enjoy a day tour of the area to further explore the beautiful region of south Greenland. Today you are free to continue to explore the area. 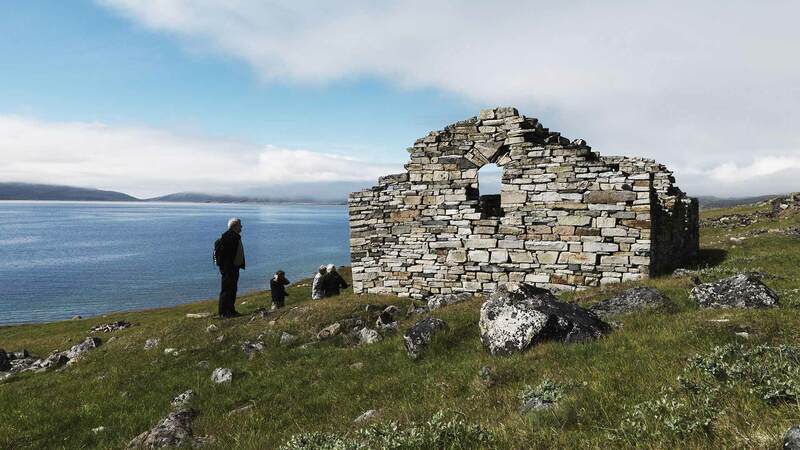 We highly recommend taking part in guided tours to learn more about South Greenland from a local, knowledgeable guide. Please contact your travel consultant to sign up for optional activities. You have the morning to relax, sleep-in or to do some last-minute sightseeing. 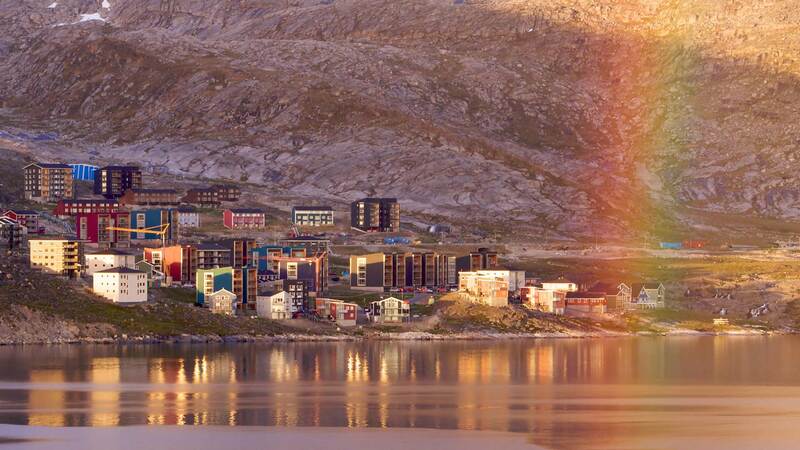 In the afternoon, you will board a flight to your next stop, the small and friendly capital city of Nuuk. After arriving and settling in at your hotel, the rest of the day is free for you to spend at your leisure. For a good overview of Greenlandic history and culture, it is recommended to spend some time at the National Museum, which houses a large collection of objects such as kayaks, umiaks and ceremonial costumes. The Nuuk Art Museum also contains many traditional artworks. For a taste of more modern culture and art, head to the Katuaq Cultural Centre, which is also a great place to enjoy a leisurely coffee break. Start the day with a flight to the charming Arctic village of Ilulissat, beautifully situated at the mouth of the 56 kilometre-long Ilulissat Icefjord. After being transferred to your accommodation, you have the rest of the day to explore your surroundings and enjoy the views. In the evening, relax at your hotel and enjoy an included dinner. Spend the next four nights in Ilulissat. For the next few days, the sky’s the limit! 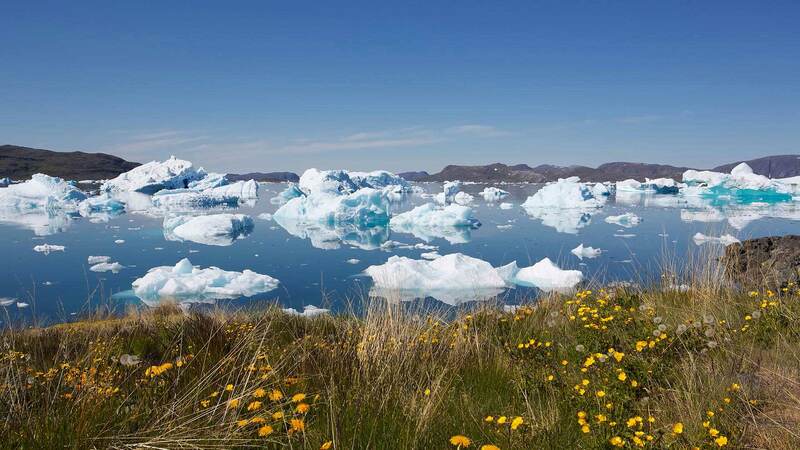 You can choose from an array of exciting optional excursions in the Ilulissat region, including helicopter rides over the ice cap, boat rides among the icebergs, tours to remote settlements or whale watching — just to name a few options. Note: We recommend booking optional activities in advance with your travel consultant, but you may also books tours at your hotel’s information desk. 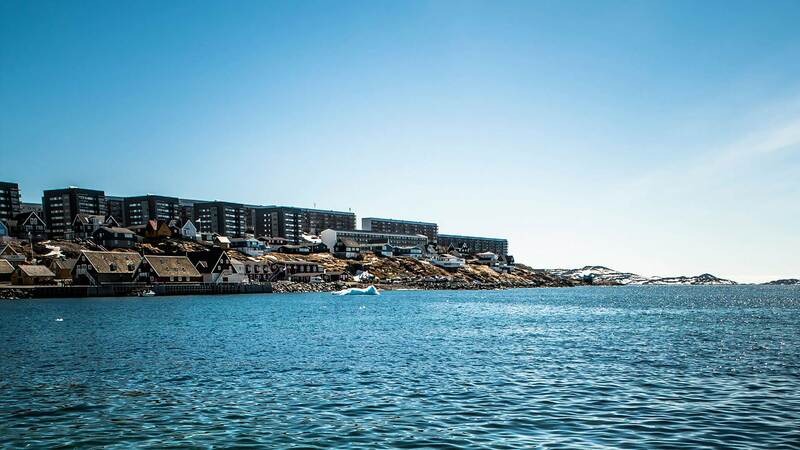 Today, have a relaxing day or plan some fun optional activities in Ilulissat. For a truly incredible experience, we recommend an evening boat tour along the idyllic Icefjord, where you will sail among towering icebergs as big as office buildings under the rosy glow of the midnight sun. And for hiking enthusiasts, the Sermermiut Valley is just a few kilometres from town, offering spectacular views from several well-marked trails. Today it’s time to say goodbye to this majestic island, but you still have time to do some last-minute souvenir shopping. On the return flight to Reykjavík in the afternoon, enjoy the stunning views over the Ilulissat Icefjord and its surrounding landscapes. As we say in Greenland, angalalluarina (have a good trip)! We loved the sailing among the icebergs tour in Ilulissat. We felt the airline bookings and hotel bookings were all as explained to us. Also they would have been difficult for us to coordinate from the States. It was such a relief to have every part of our trip proceed as planned with Nordic Visitor. There were no glitches at all, and we appreciate the professionalism. I asked Helga many questions beforehand, and she was always very pleasant and responsive. We would definitely recommend Nordic Visitor and Helga. We highly recommend arranging nights in Iceland before and after your tour to Greenland. We are happy to assist you with nights in Iceland or a complete package. This tour originates in Iceland. Due to flight times between Iceland and Greenland, passengers may need to spend a night before departure and/or on return in Reykjavik. Our travel consultants can assist with booking accommodation in Reykjavik on request. The summer climate in Greenland is generally mild and dry with average daytime temperatures of 5 -7° Celsius. But due to Arctic conditions and possible sudden weather changes, we suggest bringing warm, weatherproof outerwear, thermal layers, and good walking boots and/or rubber boots. You may also want to bring mosquito repellent and sunglasses. Please note that the itinerary can change without notice due to weather conditions.